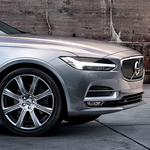 The Volvo V90 is a cross country wagon with a luxury class feel. It has performance features that will make it perform like an SUV, but with the ride of a luxury automobile. Let’s take a look at how Volvo achieves this. When the road gets slick and driving conditions change, the V90 has an all-wheel-drive system to help you maintain control. The system is computer monitored and when the vehicle speed, torque, brakes, and wheel speeds change, this system will transfer power from the wheels that are slipping to the ones with the most grip. In addition to this state-of-the-art all-wheel-drive system, it also has several drive mode settings that you can adjust to your preferences or the driving conditions. You can set it for comfort, economy, dynamic driving, off-road, or settings that meet your specific needs. An eight-speed Geartronic Automatic Transmission makes the transitions smooth in any weather.